Learn Kintsugi, the Japanese art of repairing broken pottery with lacquer mixed with gold, during this 60-minute lesson. 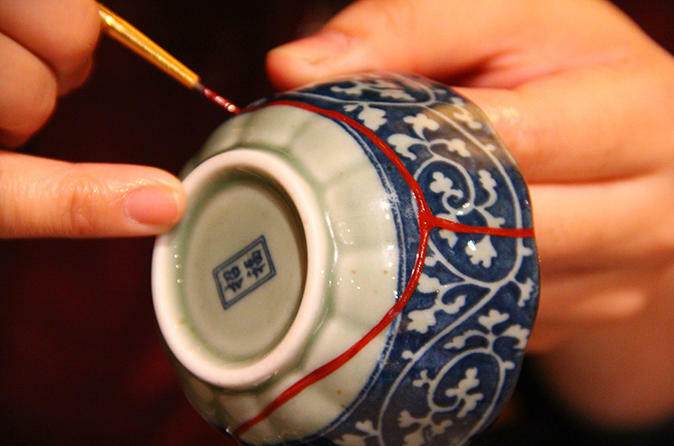 Use this technique to repair pottery while delving into this beautiful Japanese traditional craft. Get a unique perspective of the culture of Japan and learn the Japanese view of objects: that objects are meant to be broken and repaired; not thrown out. Wear a 'samue,' traditional craftsman garb, and then take home a unique souvenir when the 1-hour lesson is over. Discover the Japanese technique of transforming broken ceramic objects into revitalized art pieces, Kintsugi. This 1-hour class invites you to learn how the Japanese view objects -- they are meant to be broken and repaired, not thrown out. Don a traditional samue while using a lacquer substitute mixed with gold to repair plates and cups. Then, when the lesson has concluded, take home a Kintsugi art piece as a keepsake of this unique experience.